London’s boldest dance theatre announces the line-up for the 29th edition of Resolution Festival which runs from Friday 12 January to Friday 23 February 2018. Across 27 nights, 81 companies take to the stage to test the limits of dance through bold ideas and movement. Resolution is the place to discover the unexpected, to sample future performance trends before they migrate to larger stages and possibly discover the next big thing in dance. Almost all of today’s top UK-based contemporary choreographers presented their earliest work at this platform, including Wayne MacGregor, Hofesh Shechter, Kate Prince, Luca Silvestrini and more recently Tony Adigun, James Cousins and Sarah Blanc. For the companies taking part it’s not only a chance to perform in a world-class theatre but a professional development opportunity too. Artists follow a bespoke programme created by The Place and led by industry professionals from professional reviews to learning technical skills, marketing and publicity and receiving individual advice. It’s a crucial staging post on the long journey of developing their career, their audience and their art. This year The Place has partnered with Jacksons Lane, Artists4Artists, Rambert and Grad-Lab Dance development Project supported by The Point, Eastleigh to support emerging talent and present the latest and bravest trends in contemporary performance. With an uncompromising attitude of experimentation this year’s choreographers draw on diverse background, styles and experiences; from contemporary to hip hop, from dance theatre to circus. Using this rich language they comment and explore themes of gender, race, technology and power. Mathieu Geffré Act (12 Jan); ex-NDCW and Didy Veldman performer, returns to Resolution after becoming finalist for the Competition for Choreographers in Hanover and receiving 3rd Prize Choreography at Copenhagen International Choreography Competition. Presented by Grad-Lab, ella&co’s #nofilter (13 Jan); a satirical and self-aware piece about millennials and their obsession with their social media persona. Circomedia graduate, Tilly Lee-Kronick Ripe (16 Jan); a solo show about stereotypes of female performers mixing choreography, comedy and static trapeze. Edit Domoszlai Work 2 (26 Jan); member of Rambert Dance Company performs her own precise and athletic work. 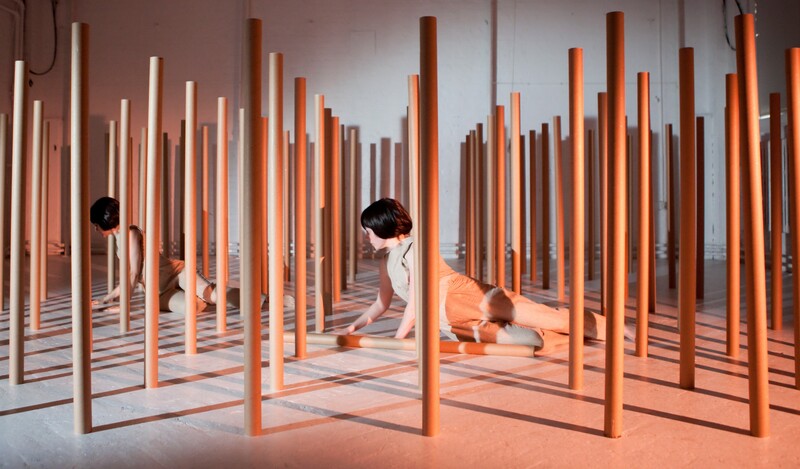 Elinor Lewis with Nuria Legarda Andueza Orchard (2 Feb); includes the navigation of a set of 90 cardboard tubes. Lewis is an Arts Admin supported performance artist. Protocol I Can’t Breathe (3 Feb); fusing physical theatre and hip hop in a piece focusing on police brutality and race in the US. Jade Hackett The Duke Joint (17 Feb); an unapologetically joyous dance theatre work, set in the slave trade era of America. Project Gibbon Gibbon (23 Feb); circus artists, José Trigeuro and Chris Patfield, team up to create a poetic and comedic juggling/movement based piece about self-awareness and internal dialogues. Produced by Gandini Juggling and presented by Jacksons Lane.